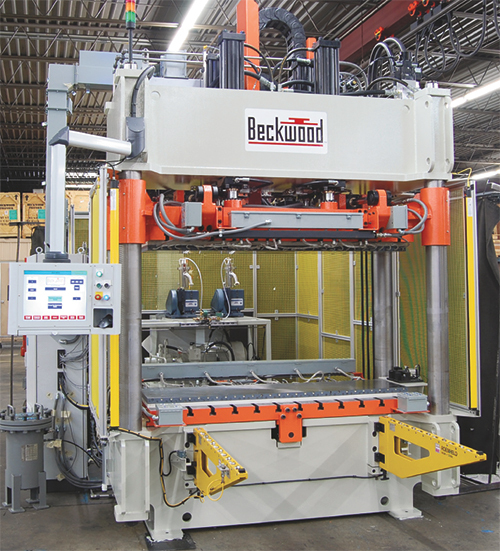 Hydraulic-press manufacturer Beckwood Press Co., St. Louis, MO, will demonstrate its Heartbeat on-board hydraulic-press health-monitoring system. Heartbeat monitors, in real time, critical press functions. If, for example, fluid-health or pump-efficiency levels drift outside of acceptable factory-set parameters, automatic notifications can be delivered to predefined departments or employees to facilitate the scheduling of necessary and planned maintenance. This pre-preventive maintenance tool keeps the operation several steps ahead of unexpected component failure, optimizing hydraulic press efficiency.